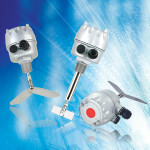 Categories: Explosionproof, Level Switches, Level Transmitters, Liquids, Marine Certified, Visual Indicator. Tags: boiler gage, boiler gauge, bypass gauge, bypass liquid level gauge, bypass liquid level indicator, bypass liquid level switch, bypass liquid level transmitter, mag gage, mag gauge, magnetic liquid level gauge. The EF/MEF series are magnetic level gauge product lines capable of providing local visual indication, level switch activation and a continuous level transmitter output, all from a single device. 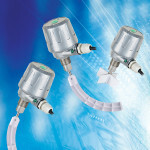 They are by-pass style level transmitter devices typically mounted on the side of a vessel. 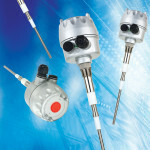 The EF/MEF magnetic level gauge devices use the principles of buoyancy and magnetism. A float with a magnet inside resides in the by-pass chamber. The chamber is attached to the vessel. The liquid level inside the chamber seeks the vessel liquid level. The float inside the chamber rises and falls as the liquid level inside the tank does the same. 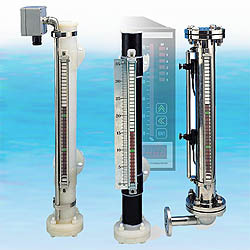 Visual indicators, level switches and magnetically activated level transducers can be attached to the magnetic level gauge by-pass chamber and are all activated by the magnet inside the float as it rises and falls in the chamber. The EF chamber has a typical ID of 2.36″ (60mm) and the MEF mini unit has a typical chamber ID of 1.18″ (30mm). These magnetic level gauge units are safer than glass level gauges that they replace. Minimum density of 0.51 S.G.